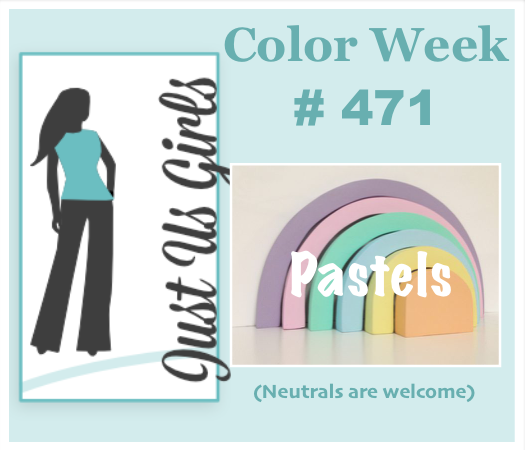 Hello, We have a great color challenge for you this week at Just Us Girls. It might be snowing and gloomy in your neck of the woods, or it may be sunny and cool like it is here. No matter what your weather happens to be, we thought we would brighten things up with some Pastel colors this week. Most of the supplies I used for this card are from Verve, except the SU-stitched circle and the MFT-scalloped rectangles. I also did some emboss resist once again. Categories: Cards | Tags: Card making, Cards, encouragement, rubber stamps, stamping, Thinking of you | Permalink. So pretty. Love the pastel colors and the emboss/resist technique. That vellum butterfly is perfect with your card. Love the soft colors, Nancy, and the ‘real’ butterfly to go along with the ones embossed on the background. Now that sentiment has a song running through my head. 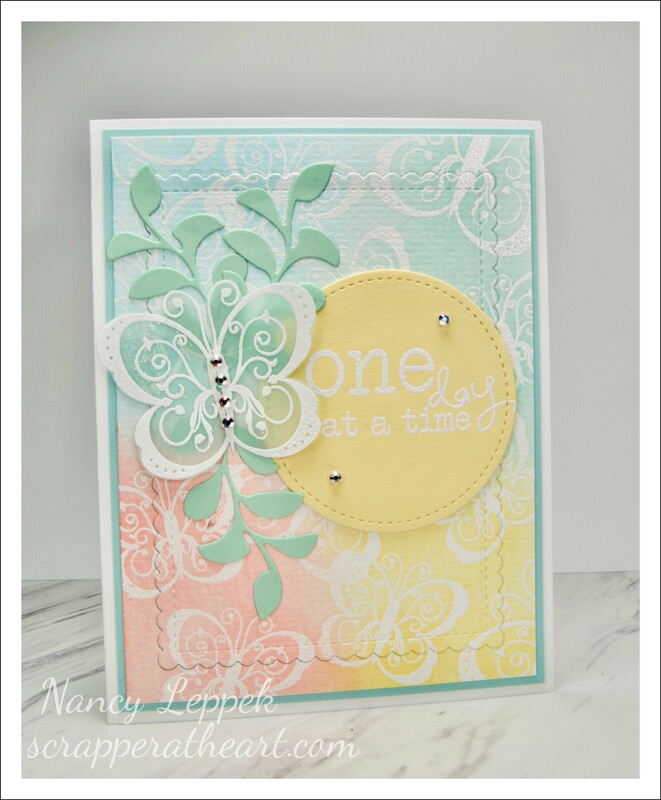 I love the beautiful pastel colors and gorgeous layout of your card. That is a great sentiment too. Nancy, your card is just beautiful. Beautiful layout and your colors work so well together. Love the butterfly on the front and in the background. Gorgeous card. I adore the multi colored background on this card with the ferns and the butterfly. This really smacks of spring. You’ve selected perfect images for pastels, with the pretty flourishes and lovely butterfly! Gorgeous! This is gorgeous! I love the emboss resist background as well as the embossed scalloped frame in the background (at least that’s what it looks like!). So pretty! How soft and gorgeous – you rocked the challenge theme Nancy. And once again, the way you are able to layer and make it all go so perfectly together is astounding!!! This is so pretty with the blended pastel colors and beautiful butterflies! Love that vellum butterfly perched upon the soft, leafy branches. Such a fantastic background! LOVE all those wonderful pastel colors! That butterfly is so cool! Great job!